The SMOVEY is a great fitness machine, which can be used as a substitute for the Nordic walking poles. By training with the smovey create sensomotoric and neuronal stimuli that affect your muscles positive. Similarly, training with the smovey affects your tissue, your organs and your nervous system. It massages your hand reflex areas and stimulates energy points according to Traditional Chinese Medicine (TCM). What is the difference to the "normal" walking? You have the smoveys in hand and thus make a much more intensive and effective training. smovey excited by the special vibration of your cells to resonate. Every step, every swing with arms vibrates your cells. smoveyWALKING is just as easy as normal walking. Even without smovey rings in hand, we move people's arms to the rhythm of the legs. The smovey enhance this natural swinging motion. By swinging and vibration you trains the entire upper body. Not to be underestimated is the training effect for your legs. Every turn the smovey brings you an additional weight on the legs, which enhances the effect of the training in this area. The advantage of smoveyWALKING there for us in the fact you can not go wrong with the motion. Anyone who can swing the arms, also handles the smoveyWALKING. 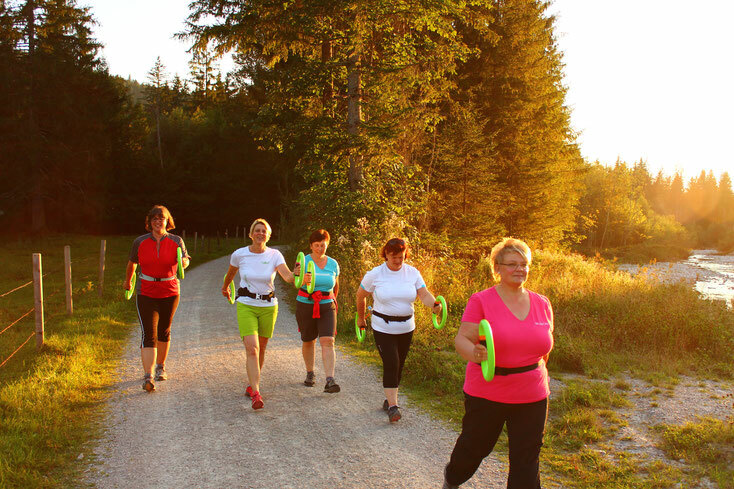 In the Nordic Walking, technique is already demanding. If you want to sign up for this course, please contact Tine Hausberger via email smovey@haus-illmau.de or via phone +49 (0)160 94741011 or Katharina Hauser via email katharina.hauser@t-online.de or via phone +49 (0)171 1452913.